Socialization is the act of teaching a cat how to be a social animal. Cats who are extremely aloof, who don't have any desire for human or feline contact, or who hiss,scratch or bite anyone who gets near them are considered ill-socialized animals (ferals are classic examples of ill-socialized cats). A kitten first learns social skills from his/her mother and littermates around the 8th week of life. It is during the 8th through 12th week that mothers and kittens will start 'playing' and thus learning the social skills they will carry through life. It is at this time that a kitten should stay with his/her mother and litter, and the kittens should have a good deal of human contact as well. Many owners adopt kittens too early (between the 8th and 10th week) and many of these owners find that their new pet isn't as well socialized or behaved as they would like. They also find that if they want a well socialized animal they now have the responsibility of teaching the kitten what the mother didn't get a chance to finish. Be wary of any pet store or breeder that is willing to sell you a kitten before the 12th week. Many kittens at shelters are strays that are found abandoned by the mother or owner and may be under 12 weeks. Remember these kittens are adoptable and are in great need of your help, but be aware that you may need to do a little extra work with them by being a surrogate mom for a little while. 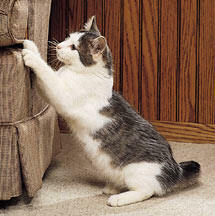 As an adult, a cat still needs to play to keep these skills honed and to keep them mentally and physically active. So even if you adopt a well socialized kitten, if you ignore, pay no attention to, don't play with, or don't spend enough time with your cat he/she may revert to anti-social behaviors. Also if you adopt an older cat who is a stray, feral, or simply not well socialized you may find that you need to completely socialize the cat before he/she acts like a 'pet'. Socializing an animal takes time and patience but is extremely rewarding! Cats, especially ferals, who you socialize yourself usually develop an extremely close bond with you. You can socialize a cat by playing with your cat for at least 2 hours a day and by providing your cat with enough toys and fun items so that he/she can play alone as well. Your cat needs to play for many reasons so make sure you allow your cat to release his or her aggressive energies in a good way. You will also want to spend a lot of time with your cat petting, touching, holding and talking to your cat. And always take it slow, only go so far as your cat will let you. Never push the cat or try to do more than your cat will allow. If your cat doesn't want contact you can still sit in the same room and just talk to your cat, this helps your cat get used to your presence and voice as well as helping your cat to learn to trust you. Eventually your cat will learn to trust you and realize that a relationship with a human isn't so bad! One of the most common problems owners have with ill-socialized cats is that these cats play too rough and don't know any better than to bite and scratch the owner to get what they want. It isn't that the cat dislikes you so to speak, just that the cat was never taught the rules of playtime or that biting and scratching aren't appropriate actions to take with humans or other cats. In such a case you may need to retrain your cat that biting and scratching isn't part of play time. To do this simply stop playing when the cat scratches or bites. Firmly say 'no', hand your cat a toy mousey, and stop playing. Also make sure that when your cat is playing nice (has the claws in, isn't biting) that you praise your cat A LOT. Make sure to also provide your cat with enough toys and play things for him/her to take out their aggressions on. And when you see your cat taking all of his/her aggressions out on that toy mouse... give praise. Eventually your cat will realize that you can play hard with toys but you can't do that with people.